It’s really no big secret! 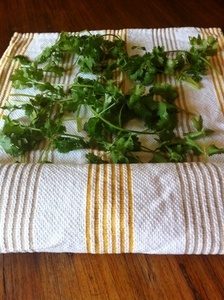 Drying herbs, no matter if they are fine (like cilantro) or hard (like rosemary), is extraordinary simple. Once washed just scattter them about on clean toweling. Roll from the bottom up gently until you’ve reached the top. Do not roll too tightly leaving breathing room for the herbs. Set aside on the counter or in the fridge for about 15 minutes. Unroll and use. Just a quick Tuesday Tip for you and yours!